The 'Int-Ball' will allow astronauts to spend more time working on experiments. Astronauts on board the International Space Station have a new robotic companion to play around with. 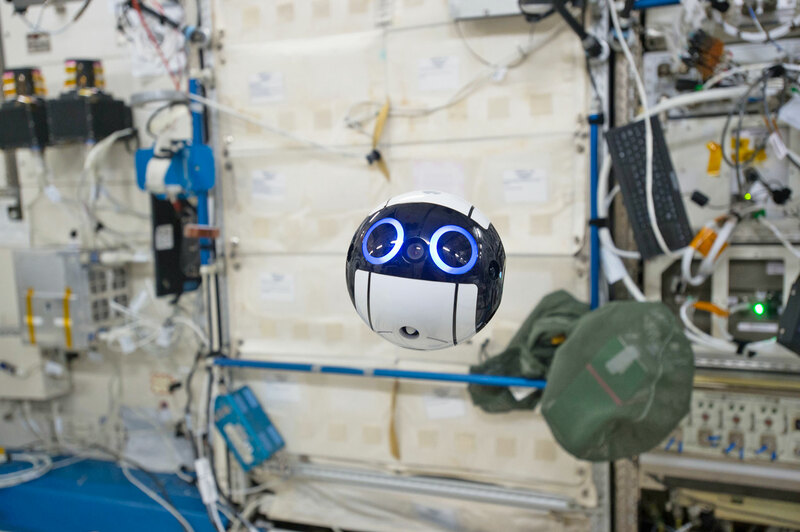 The Japan Aerospace Exploration Agency (JAXA) has released the first images shot by the "Int-Ball," a spherical camera that floats around alongside the rest of the crew. With its monochrome paint job and blue, circular eyes, it looks a little like Wall-E's Eve — or at least her head, in some kind of prototype form. Notably, the Int-Ball can move around autonomously or be controlled by operators back on Earth. The images are transferred in near real-time allowing JAXA staff to quickly evaluate problems and offer possible solutions to ISS residents. The Int-Ball could make astronauts more efficient on the ISS. JAXA says crew members spend 10 percent of their working hours with a camera in hand, photographing work or equipment that requires further evaluation. A floating camera drone could, in theory, alleviate the crew of that responsibility, giving them more time to conduct experiments and carry out repairs. The Int-Ball was delivered to the ISS on June 4th, using a SpaceX Falcon 9 rocket and, for the first time, a reused Dragon cargo capsule. It now lives inside the station's "Kibo" science module. At the core of the Int-Ball, which measures 15cm in diameter, is a three-axis control unit. The cube-shaped brain converses with 12 fans positioned near the surface of the robot, which adjust its position in zero gravity. A navigation camera looks out for pink "3D Target Makers," which serve as reference points on board the ship. The recording camera, meanwhile, is located between the two eyes so that astronauts can easily identify what it's looking at. JAXA says it's focused now on improving the Int-Ball's capabilities so that it can be more helpful and autonomous on the station.